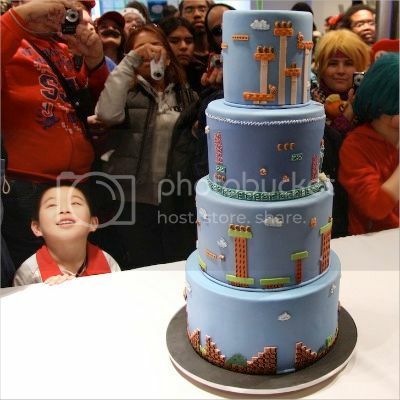 This Super Mario cake showed up at the Nintendo World Store near Rockefeller Center in New York on Sunday to celebrate the 25th anniversary of Super Mario Bros. Nintendo’s lead game designer and Super Mario creator, Shigeru Miyamoto, cut the first slice. A momentous occasion. But all this kid knows is that Flying Pastry Jesus has smiled down upon him. UPDATE: Cake-maker… located! Pink Cake Box got in touch to let me know that this is one of theirs. Via Kotaku, whose polytheistic ways have him thanking multiple cake-deities.